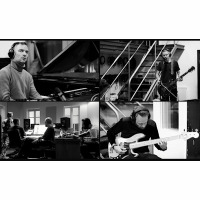 With the ink barely dry on the positive reviews of this year's Valtari, Sigur Rós's sixth studio album, the four-piece from Reykjavik are already hinting at more new material being on the horizon. And, following another hectic summer of festival appearances, Sigur Rós are thinking big. Bassist Georg Holm said on the band's website: "You are limited to what you can accomplish with the 20-minute changeovers and all other constraints of a festival... to us, this summer's really been one long warm-up for what's to come." Given that May's Valtari was both the band's most ambient-sounding record in a long time as well as their best performing in the US, it seems that Jonsi, Georg, Kjartan and Orri are really upping the ante for 2013. It was back in 2005 when the bewitching Hoppípolla rewrote the rules on uplifting soundtrack music. Enigmatic and indecipherable, Hoppípolla announced the arrival of a band already more than a decade old. It remains their most successful single to date with the group's considerable following opting to reinforce Sigur Rós's credentials as an 'album band', with each record outperforming the last. Whatever comes after Valtari, it promises much. After dates in Belgium and France, Sigur Rós will play the SECC in Glasgow on 2nd March, followed by dates in Manchester (at the Apollo) and then the Wolverhampton Civic. The UK leg of the tour closes with a pair of dates at the Brixton Academy on 7th and 8th March 2013. We will have tickets available from 9am on Friday 14th September.